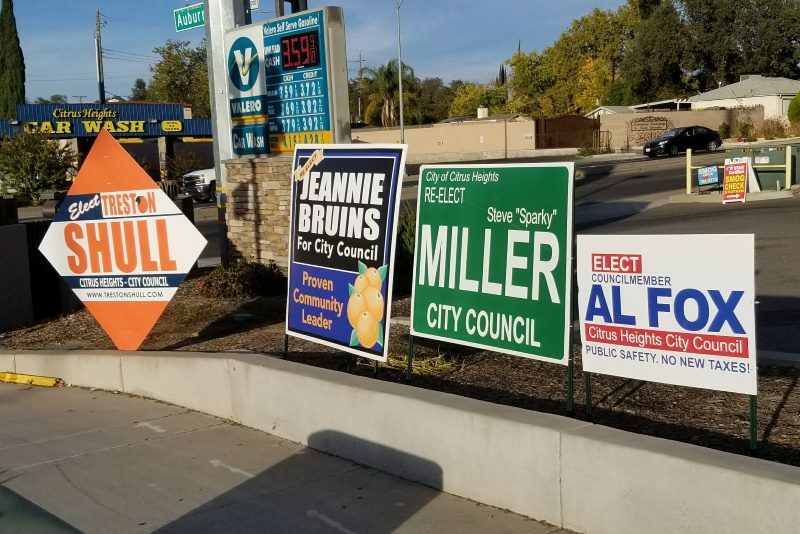 Latest campaign finance disclosures filed on Oct. 27 show an unprecedented amount of cash is being spent in the race for three seats on the Citrus Heights City Council this year. The latest financial filings cover a reporting period of Sept. 23 through Oct. 22 and show newcomers in the race continue to outspend long-seated incumbents Mayor Steve Miller and Vice Mayor Jeannie Bruins, who are both up for re-election this year along with Councilman Al Fox, who was appointed to fill a vacancy on the council last year. Porsche Middleton, a Planning Commissioner seeking a seat on the City Council this year, continues to top the list for most contributions received, reporting an additional $7,000 received in the latest reporting period — bringing her total contributions for the year to just over $48,000. Her latest contributions came largely from the California Apartment Association PAC, the Northern California Carpenters Regional Council, and the Sacramento County Democratic Central Committee, each of whom gave $1,000 or more to her campaign. Her total expenditures are listed at about $45,000, with latest large expenses listed as $1,600 to Clear Channel Outdoor, Inc., likely for several large billboards her campaign has taken out in the city, and another $1,700 to GoDaddy for web-related services. By comparison, at this time in the race for City Council two years ago, two of the top three candidates that year only reported receiving about $10,000 apiece in contributions, while Councilman Jeff Slowey topped the list with $17,600 in donations. Slowey won re-election that year and was the top vote-getter, but money didn’t end up being the determining factor for the other winner, Bret Daniels, whose campaign reported less than $5,000 in contributions and spent less than $3,800 during the entire campaign. Coming in second place for contributions so far this year is labor relations manager Treston Shull, who reported receiving an additional $5,500 during the latest period, bringing his total contributions for the year up to $30,500. His latest contributions came largely from the San Francisco Laborer’s Local 261 PAC and the United Auburn Indian Community of the Auburn Rancheria, which gave $1,500 and $2,000, respectively. His total expenditures are listed at about $24,000, with top expenditures going to TabCommunications, Inc., for campaign management, along with significant expenses related to postage, mailing and literature. Councilman Fox came in third for contributions, reporting the receipt of another $5,600 during the latest reporting period, which brings his total contributions for the year over the $20,000 mark. The bulk of his latest funding came from a trio of $1,000 donations from the Sacramento Metro Chamber, the Citrus Heights Chamber of Commerce PAC, the Rental Housing Association PAC, and a $900 donation from Gail Sanders, an individual contributor who listed her address as that of Roseville-based Sanders and Associates Geostructural Engineers. Fox’s most recent large expenses have been about $5,000 on mailing-related services and printing. Vice Mayor Bruins reported receiving an additional $4,500 in the latest reporting period — largely from the California Association of Apartments PAC, Sacramento Metro Chamber PAC, and Republic Services — bringing her total contributions to just over $16,000. Her total expenditures are listed at about $10,750, with the majority going towards campaign mailers and literature. Mayor Miller still lags behind the other candidates in funding and expenditures, reporting an additional $3,000 in contributions during the latest period from the Citrus Heights Chamber of Commerce PAC, Republic Services, and the Sacramento Metro Chamber. In total this election, he’s brought in about $9,800 and spent just under that, with his largest expense being about $2,400 spent on a campaign mailer. Campaign disclosures are required by the California Fair Political Practices Commission (FPPC) for local candidates who raise or spend over $2,000. Two pre-election disclosure filings are required by the commission, one covering a period through Sept. 22 and the other a month later. An additional requirement for candidates to file a separate form each time a donation of $1,000 or more is received. The next reporting deadline is not until Jan. 31, 2019. To view all candidates financial disclosure filings, click here.